Pakistan’s troubles with unruly floodwaters began not in July, but way back in January. That’s when a landslide obliterated 15 miles of the Karakoram Highway and created the Attabad Lake. Trouble was already afoot when we posted in February a feature on the Karakoram Highway, this truly epic road which connects Pakistan with China across the 15,397-foot Khunjerab Pass in the Karakoram Mountains. 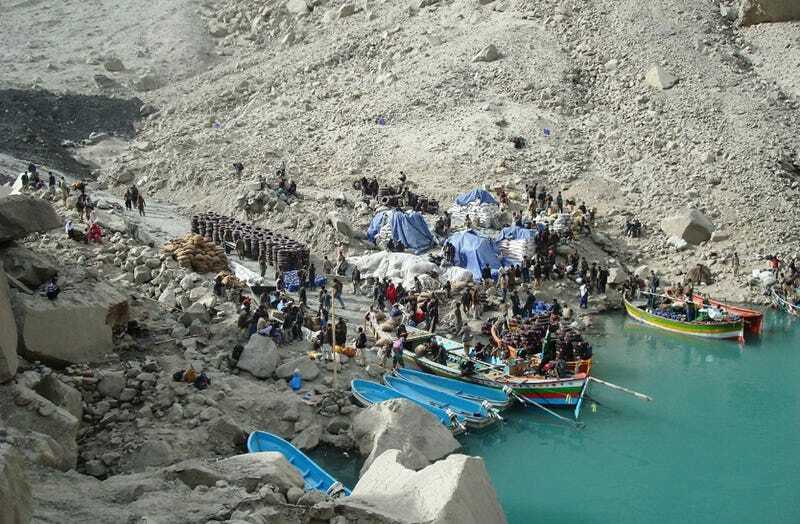 On January 4, a massive landslide rolled off the mountains near the village of Attabad in the valley of the Hunza River. The lake cuts off all land transport between Pakistan and China, requiring travelers to use small boats to traverse the lake. I am back from the disaster site, size of the land slide is humongous and huge boulders mixed with glaciated black clay has blocked the river flow. The lake size itself was huge and it has the potential to double its current water capacity before the water flow starts from the channel which is being prepared. Yes, the authorities were too slow to respond to this huge disaster which now has a potential to wash away everything which is 200 feet above the old River Hunza water level till Gilgit. Since all of the Bridges constructed on KKH are on narrowest passes, so the water current and height would be even higher on the bridges to wash them away. The Karakoram Highway was expected to remain closed for years even before this summer’s apocalyptic floods, so don’t expect to make great 4×4 drives there anytime soon. You can see more pictures of the landslide lake on The Big Picture, as well as on the PakWheels forum about the landslide.